The remarkable MEZZO TV did it for me once again. I came home from work and relax on a couch after having a great dinner with my wife. I switched on our TV and started browsing the 900 or so satellite channels visible in our region - including the Hot Bird. I press the buttons lazily ... next, next, movies, Arabic songs, nature, news, next, next, some people singing and playing in an old church, next, next... back, back... some people singing and playing in an old church. And there I am - after switching on also the surround sound system to make our neighbours "happy" since the system really brings out the bass and treble in volume. I was hypnotized by the program and stuck with it unable to change the channels for yet another relaxing action movie including a car chase somewhere there in the USA. The same has happened to me before with MEZZO TV and these total stops have always been educational and unforgettable experiences. The respectable French classical music station shows highest quality performances that I as an amateur have never heard before. While enjoying listening the performance I used the comfortable iPad to browse for some information about what was going on in front of my eyes. 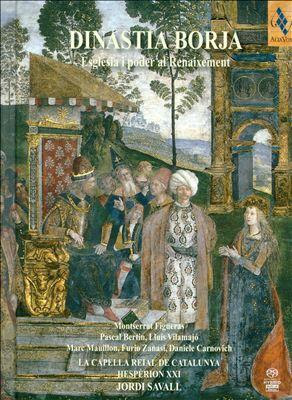 Google searches helped me to understand the background and ramifications of that quite extraordinary performance called Dinastia Borja - Esglesia i poder al Renaixement ((The Borgia Dynasty - Church and Power in the Renaissance) that was recorded in Abbaye de Fontfroide (Narbonne) on July 31, 2010. 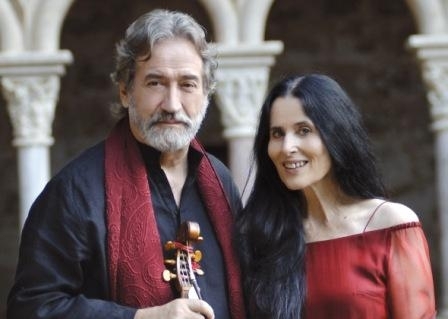 Jordi Savall is honoured by professionals as the musician who more than perhaps anyone else has introduced the wonderful Renaissance viola da gamba to modern audiences after it was superseded by the cello. Playing the instrument in total peace and harmony he not only simultaneously conducted Dinastia Borja but clearly was the soul of the performance. With only minimal movements he was in total control of the choir and instrumentalists who performed together like a single living musical organ producing both great music and powerful content. The half-giant percussionists Pedro Estevan looks to me with his white hair like a retired Rubeus Hadrig from Harry Potter - and what rhythms he created! The psalter gave harmonies with the Renaissance harp I have known only from paintings from the period. The trumpet fanfares took me to the royal palaces and castles of Medieval Spain with an intensity and majesty like no other Renaissance brass music I have ever heard. The historically accurate sound of the ensemble was enriched by virtuosi flautist Pierre Hamon playing period flutes. I have no words to describe the impact of the Medieval melodies and harmonies these singers were able to create with such inspiration! The way the choir praised our Lord Jesus Christ radiated with holiness. While genuinely Catholic some of the songs nevertheless reminded me in their austerity and arrangement Protestant hymns from the same period in late 16th century. This youTube clip may give you some idea about their enthralling performance. The 1609 royal degree stripping Moors (and Jews) of their property and forcing them out of Spain is read with such aggression and anger that the pillars of the church shook and the audience filling the building felt the horror of those days. The performance developed into a powerful inter-cultural message about humanity. The reading was followed by very beautiful and sad tunes from al'oud- the oriental string instrument that gave name to lute and is the inspiration of cithara leading to the legendary Spanish guitar. The Arabic tunes from the oriental flute touch the hardest heart and slowly the two walk away from the stage symbolizing the end of the last remains of the Caliphate of Córdoba and the presence of Moors in Spain. I was already completely taken by the performance feeling like Jon who told to his cat "listening to your stories are tiring to my eyebrows!" But then Montserrat Figueras sang the solo Death of Cesare Borgia accompanied only by a flute. An unforgettable, extremely intensive, strongly felt and touching performance. What a rich and beautiful voice! I did not understand why her husband did not look so happy while listening to this haunting extraordinary performance. 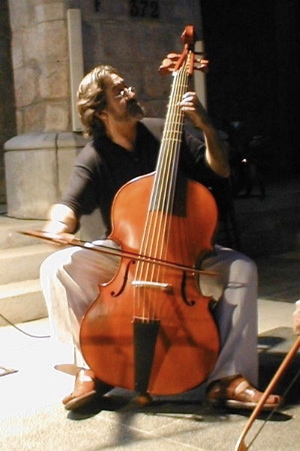 In 2000 Jordi Savall was awarded the Premi d'Honor Lluís Carulla, given for service to Catalan culture or for scientific, cultural or civic works in the Catalan language. He was awarded the Doctor Honoris Causa degree by the University of Barcelona on 27 November 2006. He was twice nominated for a Grammy, and won the 2011 Grammy Award for 'Best Small Ensemble Performance' for Dinastia Borja. Església i poder al Renaixement. In 2008 Savall was appointed a European Union ambassador for intercultural dialogue. In June 2008 he and his wife, Montserrat Figueras, were named "Artists for Peace" by UNESCO. In February, 2009 he received the Handel Music Prize from the city of Halle, Germany, and the National Music Prize from the National Council of Music and Arts of Catalonia. In 2010, he was given the Praetorius Musikpreis Niedersachsen and a MIDEM Classical Award, for his album "Jerusalem –La ville des deux Paix: La paix céleste et la paix terrestre." In 2012 Savall was awarded the Léonie Sonning Music Prize. After listening and watching through Dinastia Borja I think that from this impressive listing an especially appropriate title for Jordi Savall is the European Union Ambassador for Intercultural Dialogue. Music can cross cultural borders and bring people together but it takes special skills and spirit to succeed in doing so. Savall does it even in the most deadly bitter conflict that existed between Spanish Christians and the Moors.